Avengers: Endgame is almost upon us, so now’s the perfect time to catch up and watch Marvel movies online. All 21 of them, to be precise. 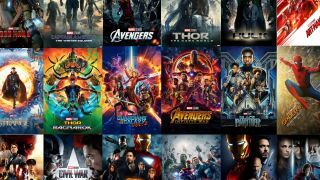 Because each MCU film is scattered across a dizzying number of streaming services, we’ve whipped up a bite-size guide on where to find them at the best price. Our team also have a few VPN recommendations to help you get around regional exclusives. Want to fill up on all the rumours, theories, and gossip before Endgame launches? We've got you covered. Wondering what a VPN is? It stands for ‘Virtual Private Network’ and allows you to geo-spoof the internet into thinking you’re somewhere you’re not. This is very handy if the likes of Avengers: Infinity War or Iron Man are available in every region but yours. It means you can continue watching films or shows while holidaying in an area where they’re not usually accessible (in fact, we’ve got a list of the best VPNs for Netflix for that very reason). Basically, VPNs are very welcome tools if you want to watch Marvel movies online but you’re not at home to take advantage of your subscription. We’ve not stopped there, either. Our team have listed where you can watch individual MCU films at their lowest price. This is more helpful than you’d think; these movies are sort of all over the shop, at least until they’re herded onto Disney+ later this year. For a further shot of blockbuster goodness, why not check out how to watch Star Wars movies online? If you’re keen to keep up with what’s going on in Westeros, you can get some tips on where to watch Game of Thrones online as well. With over 2000 servers from nearly 150 locations, Express VPN pretty much has everything you’d want from a VPN. While there’s no free trial, there is a 30-day no-hassle refund period, should you get cold feet. Your best bet is to jump onto Netflix, Amazon Prime, or Now TV if you want to catch up on all the MCU flicks - they have most of the movies between them. That'll soon change with the arrival of Disney+, of course, but for now it's the most sensible, cost-effective way to go. In the UK, the absolute simplest way to watch all of Marvel is jumping onto the Sky-owned Now TV. That’s because Sky Cinema has a large array of Marvel movies. Everything from Black Panther to Thor: Ragnarok is available to watch on-demand from the service. There’s even a bespoke Superheroes Collection! If you don’t have a Sky box, feel free to check out the best Sky TV deals to find a package that works for you. For more subscriptions, we've posted some deals below to get you started. Netflix should probably be your first port of call for MCU streaming, particularly if you're in the USA. This service boasts many of the biggest Marvel titles on its docket. Amazon Prime's a good shout if you want the most up-to-date MCU movies. Happily, you also get faster delivery for any Amazon orders you make. Win! This is a reliable way to get the more recent MCU films on demand if you're based in the UK. Want to watch each and every one of the MCU films? We've laid out the best prices for them all - from Iron Man right through to Avengers: Infinity War - in the US, UK, and Canada. US: Everything from Google Play to FandangoNOW and iTunes has Iron Man available to rent in the USA for around $2.99. To buy, however, Amazon and Google Play and are your best bets with prices hovering between $14.99-$19.99. UK: Onwards to the UK, where renting from Amazon, Google Play, iTunes, or YouTube will set you back around £2.49-£3.49. It’s £6.99 to buy from Amazon and the Google Play store, too. Canada: Robert Downey Jr.’s comic book debut can be rented in Canada on the PlayStation Store, Microsoft Store, iTunes, and Google Play for $3.99. To buy, you’ve got the choice of iTunes, Google Play, and YouTube – all are $12.99 or thereabouts. US: The 2008 red-headed stepchild of the MCU is one well worth seeking out. The US stores of Amazon and Google have the rental version for $2.99, though a 4K version is available from iTunes for $3.99. Fancy buying it? It’s between $8.99-$14.99 across the board: iTunes, Google, you name it. UK: The UK has the Jade Giant’s MCU debut available with all Amazon Prime accounts, but it can also be rented from Google Play and YouTube for £2.49-$3.49. Stick with those first two for your buying needs too: it’s only £7.99 for the HD version of the flick. Canada: It’s nice and straightforward in Canada as well. Google Play has it to rent for $4.99, and you can buy it from there for $9.99 should you want to own a permanent copy. US: My favourite piece of MCU trivia is that The Leftovers’ Justin Theroux penned this sequel. But you don’t need a miracle sent from above to watch it, thankfully. Rent it in the US for $2.99 from Google Play and iTunes. Google Play and YouTube have the option to buy for $12.99 but, should you want the HD version, stick with Amazon for a few dollars more at $15.99. UK: Try not to get Whiplash (heh) from these UK deals. It's £2.49 to rent across the board on YouTube, Google Play, iTunes, and more. Then it’s £6.99-£8 to buy, depending on where you go. Canada: Both the PlayStation and Microsoft Store carry the best rental deals ($3.49-$4.49) but, of course, the likely lads of YouTube and Google Play have the best deals to buy: $14.99 for the HD version. US: As with most of the Marvel movies in the US, it’s $2.99 to rent from Google Play, iTunes and YouTube. The best HD deal to buy can be found at Amazon for $14.99; it’s just $12.99 for standard-def at both Google Play and YouTube. The choice is yours. UK: Only Amazon and iTunes (£2.49) offer the option to rent at that low price point in the UK. It’s £7-£9.99 on Google Play, YouTube et al to buy, but £13.99 on the Sky Store, which retains UK-exclusive rights for the HD edition. Canada, though, can enjoy the God of Thunder's debut with their Netflix subscription. If you do want to rent it, however, then the official PlayStation and Xbox Stores sell it for $3.49. In fact, as a rule, those two storefronts are the go-to rental destinations for Canadian Marvel fans. If you want to buy then look no further than Google Play’s HD version for $12.99. US: Cap's first outing in the MCU is $2.99 to rent on Google Play, and $14.99 to buy too, though you may want to consider shelling out a handful more quarters for the HD edition on iTunes and Amazon for $19.99. UK: The First Avenger is the only Cap movie *not* available on Netflix in the UK. To fill that Steve Rogers-sized hole in your life, you can rent from Google Play and iTunes for around £2.49. Alternatively, buy the film from them (or Amazon) for £7-£9.99. Canada: Hilariously, Canada has Captain America available on Netflix. You can also rent it from the PlayStation and Xbox Store, or from iTunes for $3.99. US: This is it. The end of Phase One. Those in the US can rent from Google Play and iTunes for $2.99 can buy from the former for $14.99, though Amazon’s HD deal at $19.99 represents the best value for money. UK: NowTV and Sky customers get The Avengers with their subscription packages in the UK but, if you don’t have access to that, rent it from Google Play or iTunes for £2.49 or buy it from Amazon for £6.99. Canada: Again, go to the PlayStation and Xbox stores in Canada for the best rental deals. Don’t bother heading to anywhere else but Google Play or YouTube for your buying needs. £12.99 for the HD version is the best deal around, anywhere. US: Phase Two kicked off with the third Iron Man movie. To watch it in the US, you should head to Google Play or iTunes to rent it for $2.99 or buy it from Amazon for $15.99. UK: NowTV and Sky customers get the movie with their package(s), while the PlayStation Store has it to rent at only £2.49. It’s £9.99 to buy from the likes of Google Play, iTunes, and YouTube, depending on what format you prefer. Canada: You should probably be renting from the PlayStation or Microsoft Stores if you want the lowest prices. If you want to buy Iron Man 3 to keep, Google Play offers the best value for money at $12.99 (though it is, of course, available elsewhere). US: You can rent Thor's second solo adventure from Google Play and iTunes for $2.99, or buy it in HD for $14.99 on Amazon. UK: Thor's return is available for rent on Amazon for £2.49. It’s also £6.99 to keep permanently from the same site, as well as Google Play. Canada: Sorry to sound like a broken record Canadians, but to rent then, you guessed it, go to the Microsoft or Sony stores. For those without a console, rent from iTunes for $3.99. You can also buy the HD version of Thor 2 from there for $12.99. US: It’s one of the best MCU movies, but where can you find it? The US actually has it on-demand on FX Now, while it can be rented too from Google Play and iTunes for $2.99. However, YouTube has the best offer-to-buy at $12.99. UK: The UK also carries The Winter Soldier on Netflix. There’s no rental options around so, other than that, you’re going to want to buy from Amazon for £9.99. Canada: Netflix is the go-to destination again for Canada. It can also be rented from the likes of iTunes and the PlayStation Store for around $3.99 of your hard-earned dollars. Buying it, however, is not really recommended as it’s a whopping $19.99. Though, should you want to, you can buy it from iTunes. UK: While the sequel is on Netflix in the US, you’ve got no such luck for the toe-tapping original. Rent (for $2.99) or buy (for $14.99) from Google or YouTube. UK: Netflix again? Yup, subscribers to the service in the UK get to watch Chris Pratt and co. anytime, anywhere. You can also buy the movie from Amazon, iTunes and Google for around £6.99, but generally we'd recommend streaming it instead. Canada: It’s on Netflix in Canada, though. Plus, renting is available from the Microsoft and PlayStation Stores for a fairly low price. Buy it via iTunes for the HD version. UK: Make sure there’s no strings on you in the US as you scour around for the best deals. Rent it for $2.99 or buy it for $14.99 from Google. UK: Nice and simple for those in the UK - stream it on Netflix or buy it for £6.99 from Amazon or Google Play. Canada: Stick with the PlayStation Store in Canada. The plentiful platforms listed above can also do the job should you not own a PS4, but it carries both the cheapest rental option, as well as the only Canadian digital outlet that gives you the movie in HD for the best price. US: Want to watch Scott Lang for a small amount of time in the US? Rent from Google Play for $2.99. In for the long haul? Buy the HD version from Amazon for $19.99. UK: If you feel like ending Phase Two in style in the UK then head on over to Netflix and stream it directly. Otherwise buy it for £6.99 from Amazon. Canada: It’s the marginal gains that’ll make the biggest difference. Take the Canadian options available to you. Renting from the PlayStation and Microsoft stores saves you 50 cents. US: Rent this all-star extravaganza from Google or iTunes for $2.99 in the US, or buy from Google for $14.99. UK: Stream via Netflix in the UK, or buy from £6.99 on Amazon. Canada: Canadians should (again) mosey on over to the PlayStation or Microsoft stores to rent, though iTunes still has it at $3.99. YouTube and Google Play have it to buy for $19.99. US: Doctor Strange is one of the few Marvel movies available on Netflix in the US. But don’t discount renting it from YouTube for $2.99 or buying it from Amazon ($19.99). UK: Stephen Strange is rather tricky to find in the UK, and buying it is almost the only way to get your hands on the Sorcerer Supreme. If you want to buy the movie, you can do so from Google Play for £6.99, or any other digital platform of note. Canada: No, you’re not stuck in a time loop, Canada, but I’ll keep this short and sweet: stream on Netflix, rent from PlayStation or Microsoft’s stores. US: Probably worth it for the opening alone, you can rent the second Guardians movie in the US from Amazon for $3.99 or buy it from YouTube. It’s also on Netflix for the time being. UK: You can find the movie on Now TV or Sky in the UK, or buy it from Google, iTunes or Amazon for around £6.99. Canada: Canada has things nice and straightforward again (those getting a little envious in the US may want to check the VPNs down below). Netflix has the film on-demand from any compatible device. Failing that, you can rent from all good digital platforms, though it’s cheapest on Google Play at $3.99. US: The webhead’s MCU debut has plenty of options laid out should you want to watch it in the US. Amazon and STARZ has it available to stream, or you can buy it from YouTube for only $9.99. UK: While renting this from the PlayStation Store is your only option in the UK, you can watch via Now TV and Sky at any time. Go somewhere different if you want to buy Homecoming, though. Amazon has it for £5.99, which is a steal. Canada: Sorry, Canada actually has a bad deal on this one. You can either watch it via The Movie Network, rent at a higher price point than normal via Google for $3.99, or get the 4K version from iTunes for $24.99. Eeep. US: Thor: Ragnarok brought the funny, and we’re bringing the deals - Netflix has it to stream in the US. You can also rent it for a meagre $3.99 from Amazon/buy it for $19.99. UK: Thor: Ragnarok is available on Sky/Now TV in the UK. If you just can’t wait, you can buy it from the Google Play store for £6.99. Canada: Canada also has Thor’s third movie on Netflix. Don’t forget to head to the Microsoft Store should you want to rent, especially as the cheapest deal to buy Ragnarok is $24.99 from iTunes. US: This excellent origin story is now FREE on Netflix in the US, or you can rent it from iTunes ($3.99) or buy it from Amazon ($19.99). UK: The Black Panther's first solo outing is currently available on Now TV. If you want to buy it instead, it’ll set you back £7.99 on Amazon. Canada: No Black Panther on Netflix for Canada (and, as you’ll see below, all Marvel movies on Netflix are going the way of the dodo). Instead, head to Cineplex to rent or YouTube to buy. US: Scott Lang's return to the world of superheroes is available to rent for $2.99 from the Google Store or to buy for $13.99 on the same site. UK: Marvel's shrinking hero is currently available to stream on Amazon Prime, or to buy for £9.99 at the Google Store. US: Want some Thanos-related fun in the US? Amazon, YouTube, Google Play and iTunes all have it available to buy for $19.99 or to rent from the latter two for $2.99. You won’t cry this time, will you? UK: Avengers: Infinity War is now available in the UK - hooray! Amazon, YouTube, and iTunes all carry it for £9.99 but, get this, you can stream it on Now TV. Canada: It’s slightly pricier in Canada. It’s $24.99 to buy the movie on iTunes, Google Playor YouTube, or around $3.99 to rent. As you may have noticed from the extensive list above, different regions carry different perks and benefits when it comes to finding Marvel movies. Some are on Netflix in one region, while might be cheaper to rent in another. For that, you’ll need a VPN. Some of the best on the market are available below, but the logic behind it is simple: boot up your VPN, select which country you want to browse from the software will trick any websites – such as Netflix – into thinking you’re currently in that location. Perfect for those looking to jump into Canada’s superb MCU library on Netflix. As most of the good stuff is available on Netflix, you should absolutely check out the best VPNs for Netflix before committing to a decision here. However, the three below are the pick of the bunch when it comes to the greatest VPNs out there, no matter your budget. Boasting round-the-clock support and allowing six devices to stream simultaneously, it’s not hard to see why Nord VPN is getting more and more popular. Those looking for a long-term VPN should look no further, thanks to its unparalleled three-year-plan. Want to see what all the VPN fuss is about? Vypr VPN not only stacks up to the best of them in terms of features, it also comes with a three-day trial. It’s great at maintaining high speeds too, which is perfect for those looking to stream in 4K.